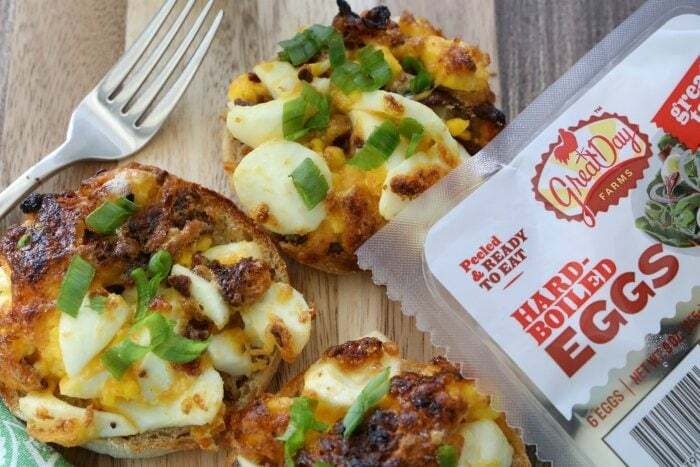 This super fast breakfast will please a crowd- it’s so easy to make these egg cheese muffin melts that the recipe will become a household staple- I promise! Ever get bored with breakfast? I feel like when the seasons change I start to get so tired of the same breakfast. But since I’m not much of a morning person, I like to have quick and easy options- and if they are make ahead, that is even better. (Like my mango chia overnight oats– delicious and fast!). So when I went to a brunch a few years ago and a woman served these delicious egg Cheese Muffin Melts I was hooked- they only took her 10 minutes to prep, 5 to bake and had all the best ingredients- eggs, cheese, fried bacon, and of course mayonnaise! Makes for a super fast breakfast that everyone in my family loves. For this recipe, I actually used Great Day Farms precooked and peeled boiled eggs which made the recipe super fast because I didn’t even have to boil or peel the eggs. 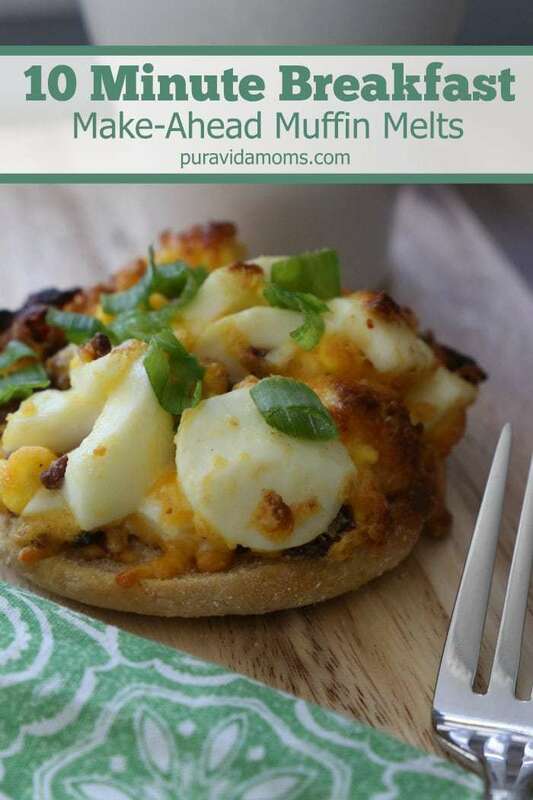 Great Day Farms had sponsored some content on my Instagram page and my Facebook- and that’s how I got the idea to publish this egg cheese muffin melts recipe here on the blog too! Great Day Farms did not sponsor this post. 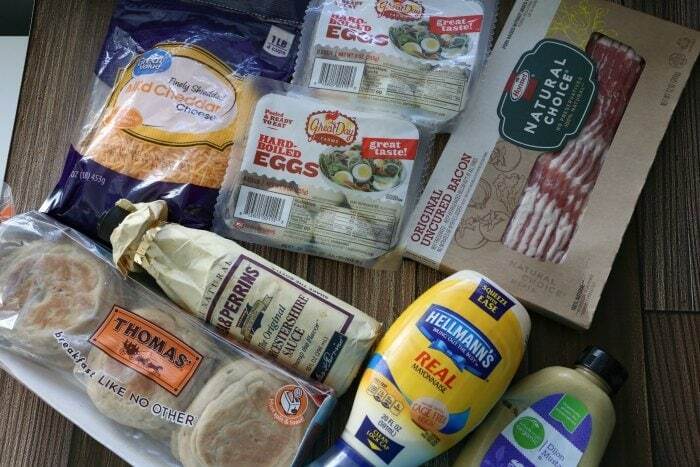 To make everything even easier, I bought pre-shredded cheddar cheese and the pre-sliced English muffins too. I even cooked the bacon in the microwave because- well- I said it was a super fast breakfast, but I meant super easy too! First just mix all the ingredients, and then put them on the baking pan. 5 minutes under the broiler and you are ready to eat! This recipe is also super easy to make ahead- I store the egg and cheese mixture in an air tight container in the fridge and then just put it on top of the English muffins before I broil them. Before I had kids, I would just broil a single muffin for breakfast and eat it with some fruit- this batch of egg cheese muffin melts would last me for a whole week of breakfasts! I even used a countertop oven so that I didn’t have to use the big oven for just one English muffin. This egg cheese muffin melts recipe is easy to double or triple- but I do find that using less mayo means that the mixture does not bind well. I have lightened the recipe up by using the Mayo made with olive oil, or the reduced fat type. This is definitely not a light recipe- but for me it was packed with protein and kept me going through the first four hours of teaching high school- and that was enough for me. Now it’s a fun indulgence for everyone in the family! 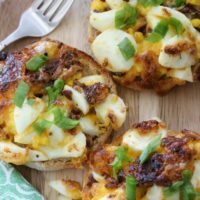 This super fast breakfast will please a crowd- it's so easy to make these egg cheese muffin melts that the recipe will become a household staple- I promise! Roughly chop the hardboiled eggs. Finely chop or crumble the bacon. Combine all ingredients in a small bowl. 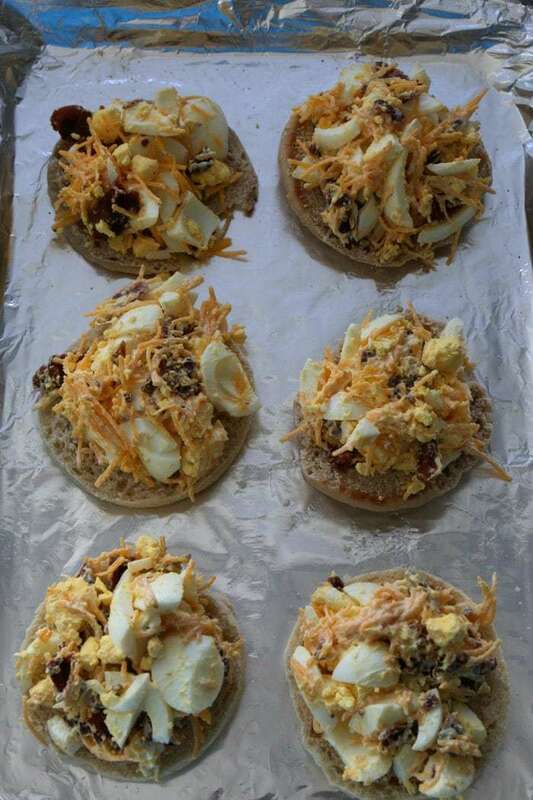 Slice the English muffins in two, and evenly divide the egg and cheese mixture over the muffins, for a total of 6. Broil on high, about 6 inches from the broiler, for 5 minutes or until golden on top. Serve warm with your favorite fruit salad and coffee! Note- This is a great make-ahead recipe. 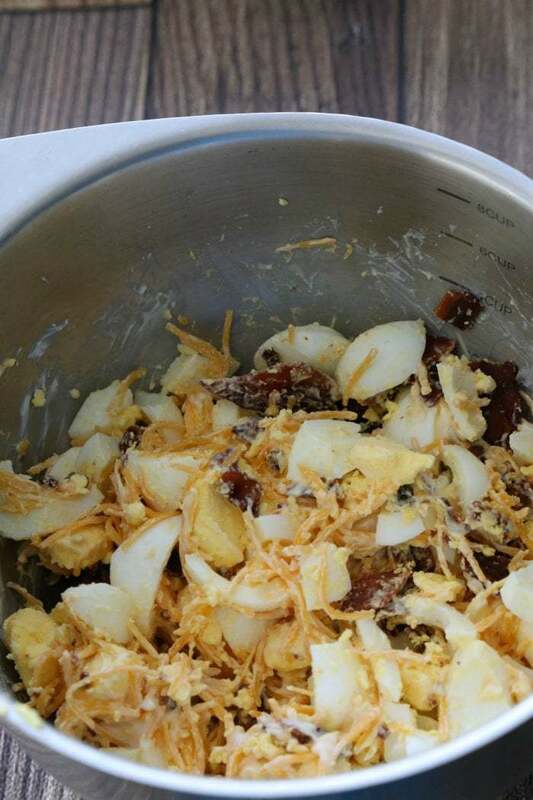 Simple store the egg and cheese mixture in an air tight container until ready to use- up to one week. More breakfast from Pura Vida Moms?